Professor Nancy Martin, Rachel Bennett, Chris Hutchison and Justin Koppelman traveled to Washington, D.C.
‘Hope is a beginning,’ Nobel Laureate Elie Wiesel tells Holocaust remembrance audience. Chancellor announces passing of Marv Meyer, Griset Chair in Bible and Christian Studies. James H. Charlesworth is Princeton Theological Seminary’s George L. Collord Professor of New Testament Language and Literature and the 2018 Visiting Griset Chair in Bible and Christian Tradition at Chapman. He has authored over 400 articles or book chapters, edited or co-edited more than 100 volumes, and written some 40 monographs. He specializes in the Apocrypha and Pseudepigrapha of the Old and New Testaments, the Dead Sea Scrolls, Josephus, Jesus research, and the Gospel of John. As director of the Princeton’s Dead Sea Scrolls Project, he has worked on the Qumran Scrolls to make available, in cooperation with more than fifty international specialists, an accurate text with apparatus criticus, an English translation, and an introduction. He has excavated at Migdal, Bethsaida, Nazareth, Jerusalem, Khirbet Beza, Qumran, and elsewhere and been honored for his work around the world. An ordained minister in The United Methodist Church, he also serves as advisor to the denomination's World Missionary Council and preaches and lectures globally. Kayleen Asbo is a passionate scholar—a cultural historian, musician, writer and teacher who weaves myth, music, psychology, history and art with experiential learning. Dr. Asbo’s doctoral research culminated in her “Passion and Paradox: The Myths of Mary Magdalene in Music, Art and Culture.” A faculty member of the Pacifica Graduate Institute and the San Francisco Conservatory of Music, she also regularly teaches for the Osher Life Long Learning Institutes at UC Berkeley, Sonoma State University, and Dominican University and leads pilgrimages to sacred sites in Europe, including the south of France to “Walk in the Footsteps of Mary Magdalene.” Join us for an afternoon as Dr. Abso leads us through a labyrinth of history, art, interactive experiences and sacred music in search of the truth about Mary Magdalene’s role in the early days of Christianity and what she has to teach us about surviving—and thriving—in these complex times. Congratulations to Religious Studies Major Marilyn Love! Religious Studies Major Marilyn Love has been selected to receive the 2014-2015 Town & Gown Scholarship, a prestigious campus scholarship awarded to juniors or seniors in all campus competition in recognition of academic excellence and exemplary commitment to service. CONGRATULATIONS MARILYN! The Department is pleased to announce that renowned New Testament scholar Donald Hagner has been selected to be the 2014-2015 Visiting Griset Professor of Bible and Christian Studies. Prof. Hagner is George Eldon Ladd Emeritus Professor of New Testament at Fuller Seminary and has had a long and distinguished career in New Testament Studies with an extensive list of publications, including The New Testament: A Historical and Theological Introduction (2012). He has delivered a number of distinguished named lectures, his international reputation affirmed by the many awards he has received and the considerable time he has spent at Cambridge University as well as the University of Tubingen, the Pontifical Institute, and other universities in Sweden, France, Australia, Germany, Singapore, and Italy over the years. We are delighted that Chapman students will have the opportunity to study with such a distinguished scholar in the field, and he will also be delivering a campus lecture in the spring. Prof. Hagner will be teaching courses on the introduction to and interpretation of the New Testament. Congratulations to Prof. Marilyn Harran! Dr. Harran co-wrote with Leon Leyson and his wife Elisabeth, his memoir of surviving the Holocaust, entitled The Boy on the Wooden Box: How the Impossible Became Possible…on Schindler’s List. This best-selling memoir is already being lauded as a classic, compared to Anne Frank’s Diary, and is being translated into 17 languages, as a story that will become a staple in school curriculums throughout the world. It was an Amazon Best Books of the Month in August 2013 when it first came out and has received a starred review in Publishers’ Weekly, Kirkus Reviews, and Voya as well as rave reviews from readers on sites like Goodreads and Amazon and newspaper book reviewers around the world. “Only occasionally does a book come along that I can recommend to everyone I meet. This is one of those books,” wrote Angela Crocomb in her review. The writing and the story are compelling and will no doubt transform hearts and minds, embodying Prof. Harran’s deep commitment to Holocaust education. It is a truly great contribution, both to scholarship on the Holocaust and to people around the world who will read it for years to come! Congratulations to Religious Studies Majors Honah Thompson and Leanna Bonds! Honah Thompson has been selected to receive the two most prestigious campus scholarships awarded to juniors or seniors in all campus competitions. In recognition of her academic excellence and her extraordinary commitment to service, she is a recipient of both the 2013-2014 Town & Gown Scholarship and the 2013-2014 Schweitzer Scholarship. Leanna Bonds has been selected to receive the 2013-2014 Willis Fisher Endowed Award Scholarship, given to the senior who will make the most significant contribution to education in the field of religious studies. Congratulations Honah and Leanna! On Thursday, May 2, 2013, during the Kugelman Awards Ceremony held in Beckman 404, the Religious Studies department awarded Cambria Findley-Grubb with the award for Outstanding Student in Religous Studies for the 2012-2013 school year. Cambria was also awarded Departmental Honors along with Anne Mellott and Jessica Anderson. 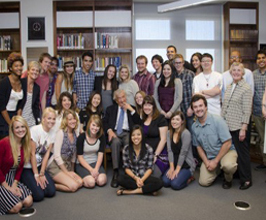 On Friday, April 19, 2013, the Alpha Lambda Lambda Chapter at Chapman University's Theta Alpha Kappa held an induction ceremony for sixteen religious studies students. To be eligible for the Theta Alpha Kappa honor society, students must have taken 12 credits in religious studies or theology with a 3.5 GPA and an overall GPA of 3.0. Theta Alpha Kappa has over 300 local active chapters across the United States. The ceremony featured statements by Dr. Julye Bidmead, chapter President Cristina Smith, and Rev. Dr. Gail Stearns on future Town & Gown events, please visit the Town & Gown website. 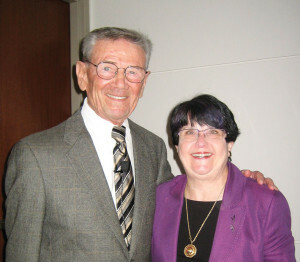 Dr. Phyllis Herman and Rev. Nancy Brink led a group of students to India over interterm 2013 for a course entitled REL 335a - Hinduism and Religions of India. The 17-day trip took place on January 7-24 with three days of on-campus lectures before they went off to India. The course focused on the study of the historical development of Hinduism and other religions in India through texts, practices, and worldviews. The students travelled throughout India including New Delhi and Jaipur.